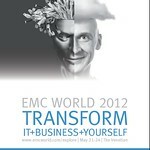 EMCworld 2012: Trust and marketing, can they coexist? Recently while at EMCworld in Las Vegas (Thanks btw to EMC who covered coach airfare and 3 nights hotel) I had the opportunity along with group of other industry analysts and advisors to have a series of small group meeting sessions with key EMC leadership. These sessions included time with Chairman of the Board of Directors and Chief Executive Officer Joe Tucci, Chairmen of VCE Michael Capellas (who is also on the Cisco Board of Directors), President and Chief Operating Officer, EMC Information Infrastructure and Cloud Services Howard Elias, President and Chief Operating Officer, EMC Information Infrastructure Products Pat Gelsinger, and Executive Vice President and Chief Marketing Officer (CMO) Jeremy Burton. Joe Tucci is always fun to listen and engage with in small groups and conveys a cordial confidence when you meet face to face. Howard Elias who is now heading up the services business talked about walking the talk with services, public and private cloud including what EMC is doing internally. Michael Capellas had some good insight into what he is doing with VCE, along with his role on the Cisco BOD. Pat Gelsinger had some interesting points however seemed a bit more reserved than in earlier sessions. Jeremy Burton who is normally associated with the effective marketing company or everything movie campaigns at EMC did not use any backdrops, visual aids, theatrics or Vegas style entertainment during his session. Of the above-mentioned executives, the one that impressed me the most, and talking with other analysts/advisors had similar perspectives was Jeremy Burton. I have seen and heard him talk before in live and virtual venues along with what he is doing to focus EMC messaging and themes. A common comment and theme in talking with other analysts and advisors was that in five minutes, Jeremy did more to advance, clarify, articulate and explain who EMC is, what they are doing now and for the future. Trust was one of the themes of the EMCworld event as it pertains to collaborating with vendors and service providers as well as consultants, advisors and others. Trust is also important for going to the cloud on a public or private basis. It is easy to talk about trust however, it is also something that is earned and is important to keep up and protect. Normally given some of the stigma associated with marketing and or sales, trust too often becomes a punch line or term tossed around with skepticism, cynicism or empty promises. The reason I bring trust up in this discussion was that in Jeremy’s interaction with those in the room, whether others realized it or not, he was working on planting the seeds and establishing the basis for trust. Does that mean there is automatic trust now in anything that EMC or their marketing organization says or more so than what heard from other organizations? Perhaps some will automatically take what is heard and go with that as gospel however, they may be doing that already. For others who are skeptical by default and do their homework, analysis, research and other related tasks, they may be more likely to give the benefit of the doubt vs. automatically questioning everything looking for multiple confirmations and added fact checking. As for me, I generally take what any vendor or their pundits say with a grain of salt giving benefit of doubt where applicable unless trust has been previously impacted. In the case of EMC, I generally take what they say with a grain of salt. However, a level of trust and confidence can make validating what they say sometimes easier than with others. This is in part due to knowing where to go internally for details and information including NDA based material and the good job their analyst relations team and other group do on building and keep up relationships. Does this mean I like EMC more or less than other vendors? It means there is a level of trust, communication, relationship, contact, interaction and access to resources with EMC that might be more or less than with other vendors. Disclosure EMC along with some companies they have acquired have been past clients. What impressed me the most was while other executives were engaging to different degrees, when I asked Jeremy how he and EMC balances entertainment (videos and movies, theatrics), education (expanding knowledge of EMC solutions, technology advancement) and being engaging (not just sales calls, social media, golfing or other in person activities) to drive business economics his response included all three of those aspects. Ok, I know, some of you should be saying that is the job and role of a marketing person to be an effective communicator which I would agree, however why don’t more marketers do a more effective job of what they do? In other words, Jeremy educated by sharing what and why they are doing certain things, Jeremy engaged with the entire audience while answering my question however not singular responding to me, he also entertained with some of his answers while also keeping them to the point, not rambling on. Afterwards I had a few minutes to talk one on one with Jeremy without the handlers or others and I can say it was refreshing and as is too of the case with marketers, there is trust. That does not mean I will take anything verbatim or follow the scripts or other things the truth squads want preached or handed out from EMC, Jeremy or any other vendor for that matter. I can say that in the few minutes up close and in a smaller setting, EMC has a secret weapon who can do more to build and convey trust and that is Jeremy Burton, hope I am not wrong ;).